Austin Plane Crash: Joseph Andrew Stack Left Sick Suicide Note for IRS to Take "Pound of Flesh"
NEW YORK (CBS) Joseph Andrew Stack, the man the FBI believes crashed a small plane into an Austin office complex out of anger at the IRS, may have left a disturbing online manifesto in which he ranted against the IRS, the Catholic Church, tax loopholes, bailouts and his own sorry state of affairs. 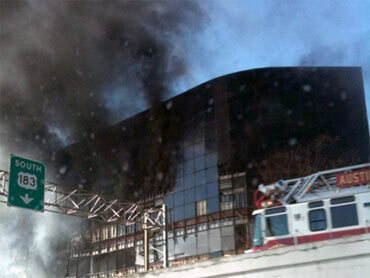 Photo: Echelon Building, Austin, Texas Feb. 18, 2010. "Well, Mr. Big Brother IRS man, let's try something different; take my pound of flesh and sleep well," someone named Joe Stack wrote. The Web page signed today as his death date. It was created Feb. 16 and last modified this morning at 6:42 a.m. according the page's source code. The FBI said they believe it is real. 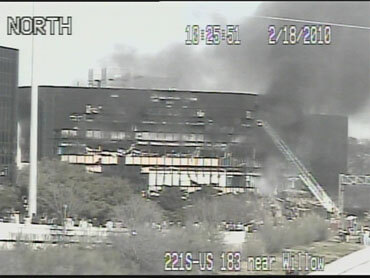 The FBI believes Stack burned down his own house Thursday and crash landed a plane into the Echelon building in Austin where the IRS maintains several offices. 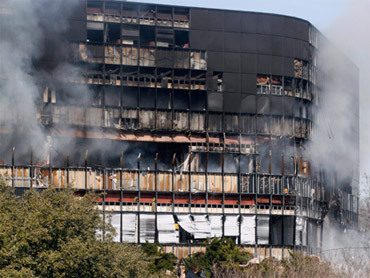 CNN reported that as many as 190 IRS employees work in the building. At least one person was missing and two people were taken to a hospital, according to Assistant Austin Fire Chief Harry Evans. Their conditions and identities were not immediately known. Joe Stack's web page starts out "If you're reading this, you're no doubt asking yourself, 'Why did this have to happen?'" He talked about the "storm raging in my head" and railed against taxation without representation. "Anyone who really stands up for that principal is promptly labeled a 'crackpot', traitor and worse," the page says. Stack was angered by a "handful of thugs and plunderers (that) can commit unthinkable atrocities" including bailed out GM executives and the drug and insurance companies who "are murdering tens of thousands of people a year and stealing from the corpses and victims they cripple." He was pissed at politicians of all stripes and outraged at the IRS, which he believed unfairly gave tax loopholes to big corporations and the Catholic Church, but not regular Americans. He said he tried to exploit the same loopholes but it backfired. That "little lesson in patriotism cost me $40,000+, 10 years of my life, and set my retirement plans back to 0," he wrote. He hoped that the "the American zombies wake up and revolt," and at times expressed that he was at a breaking point. "I know I'm hardly the first one to decide I have had all I can stand," he wrote. "It has always been a myth that people have stopped dying for their freedom in this country, and it isn't limited to the blacks, and poor immigrants. I know there have been countless before me and there are sure to be as many after. But I also know that by not adding my body to the count, I insure nothing will change. I choose to not keep looking over my shoulder at "big brother" while he strips my carcass, I choose not to ignore what is going on all around me, I choose not to pretend that business as usual won't continue; I have just had enough. " He ended with," The communist creed: From each according to his ability, to each according to his need. The capitalist creed: From each according to his gullibility, to each according to his greed." February 18, 2010 - Joe Stack Suicide Note Full Text: "American Zombies Wake Up and Revolt"
February 18, 2010 - Austin Plane Crash: Joseph Andrew Stack Left Sick Suicide Note for IRS to Take "Pound of Flesh"